Are you up to speed on all your streaming jargon, buzzwords, and acronyms? Do those words and phrases pour tantalizingly from your mouth into your customer’s waiting ear, you silver-tongued devil? We’re guessing you could use a primer. These definitions aren’t the official technical descriptions — they’re what you might say to, you know, a human. There won’t be a prize for knowing it all, but a happy customer will be your reward. Streaming. Delivering digital multimedia entertainment (TV, movies, music, gaming) via the Internet or a network. Streaming Box/Streaming Device/Streamer. Of non-custom devices, the highest-performing way to enjoy streaming TV and movies. The most likely to have state-of-the-art audio and video formats. Most popular models: Apple TV 4K, Fire TV, Nvidia Shield TV, and Roku Ultra. Streaming Stick. Scaled-down version of Streaming Box (above). Jams directly into HDMI port. Less horsepower and speed then a streaming box. Depending on the device, a stick could be missing amenities such as an Ethernet port, external storage, or even a remote. Examples: Fire TV Stick, Roku Streaming Stick, Google Chromecast Ultra. Streaming OS. “OS” stands for Operating System, the software brain of a streaming device. Apple TV runs on tvOS. Nvidia Shield TV runs on the Android TV OS. Fire TV uses a custom version of Android. Roku’s OS is proprietary. Streaming Service. A company that delivers entertainment over the Internet. Video examples: Netflix, Hulu, Vudu, Amazon Prime Video, HBO Now. Audio examples: Spotify, Rhapsody, Pandora. Gaming examples: Twitch, Steam. OTA. Stands for “Over the Air,” a term used for television signals that are broadcast to antennas. Set-Top Box. Literally, a box that sits atop your TV set. Examples include a cable box or a satellite box. Often, set-top boxes come with streaming capabilities (often with severely hamstrung audio and video performance). Gaming Console. Videogame-first devices (Sony PlayStation, Xbox, etc.) that often include streaming capabilities (usually with more dealbreakers than a dedicated streaming box). Smart TV. An Internet-connected TV that enables streaming, among other online features. Streaming performance is often hampered by a confusing user interface and frustrating user experience, along with limited audio/video format compatibility. User privacy remains a stubborn issue. App. Short for “Application,” it’s the software you choose to run on your device. Spotify is an app, as is Netflix. Lean Back Experience. A version of an app designed for the big-screen experience — with larger targets more easily accessed from a distance and by remote, and darker, easier-on-the-eyes backgrounds for home theaters. A good example is YouTube for Apple TV 4K versus YouTube for PC/Mac browsers. User Interface (UI). The screens/pages, buttons, and other elements you see when you turn on and use a device such as a streaming box. User Experience (UX). How successful you are with chosen tasks, and you react and feel, when using a device such as a streaming box, its remote control, and/or its mobile app. Mirroring. Feature that allows the user to “mirror” or duplicate whatever is on their mobile device (smartphone, tablet) screen to their big-screen TV. Most streamers support this feature; however, Android TV streamers are locked to Android devices, and the Apple TV 4K is locked to Apple devices for mirroring. External Storage. Any gadget that allows you to expand the space on a device for additional apps, documents, photos, video, music, etc. Examples: external hard drive, USB thumb drive, SD card, microSD card, Network Attached Storage (NAS). Pixel. Short for “Picture Element.” It’s like one piece of a jigsaw puzzle, but more uniform than that. In a TV picture, a pixel is the smallest sample of the original image. In a Full HD or Ultra HD image, it takes millions of pixels to create the entire image. Megapixels. “Mega” means “Millions.” Megapixels (MP) is millions of pixels. As an example, 10 megapixels is 10 million pixels. Bits. Bits are the information that make up a digital signal that can be broadcast, streamed, or stored on Blu-ray disc. It takes millions of these to make a high-definition TV picture. The pixels you see on your TV screen have been delivered to you via these bits. Megabits. Millions of bits. It takes several megabits of information per second to deliver an HD or 4K picture. 4K or Ultra High Definition. The current (2018) state of the art in video picture quality for consumers. A 4K picture is nearly 4000 (precisely, 3840) pixels wide by 2160 pixels tall. Multiply 3840 x 2160 and you get a bit less than 8 million pixels, or eight megapixels (MP). 1080p. A high-definition TV picture that is 1080 pixels in height (and 1920 pixels wide, to maintain a 16:9 shape or aspect ratio). The “P” stands for “progressive scan,” which displays all 1080 rows of pixels at once, 60 times per second. That makes the picture clearer, especially with motion. 1080p is typically called Full HD and is the type of HD you will find on Blu-ray discs and streaming services. 1080i. A high-definition TV picture that is 1080 pixels in height (and 1920 pixels wide). The “i” stands for “interlaced scan,” which alternates between odd and even rows of pixels to display a TV picture. While only 540 of the 1080 pixels are truly onscreen at any time, the pixel-row alternating happens quickly enough to be seamless to the eye. 1080i is one of two common broadcast HD standards, used by both CBS and NBC. 720p. A high-definition TV picture that is 720 pixels in height (and 1280 pixels wide). The “P” stands for “progressive scan,” which displays all 720 rows of pixels at once, 60 times per second. While the resulting number of pixels is less than you get with 1080i, rapidly moving pictures are rendered more clearly, as all 720 pixel rows are rendered simultaneously. 720p is one of two common broadcast HD standards, used by both Fox and ABC. Scaler (or Upscaler). The circuitry that takes a lower-resolution video image and expands its resolution to match the format of the display. For example, every 4K TV has a built-in scaler that expands (or “upscales”) a picture such as a 1080p or 720p image to the TV’s native 4K resolution. All 4K streaming devices also include such a scaler. Frame Rate. All moving pictures (movies, TV shows, etc.) are made up of a series of still pictures (“frames”). The frame rate is the number of frames that pass before your eyes each second. When each frame is different, that’s how we perceive motion. Theatrical movies typically move at 24 frames per second (24fps or 24Hz). Television and digital video typically move at either 30Hz or 60Hz. Native. The visual default for a device or for software such as movies or TV shows. For example: even though a 4K TV can display images with 1080p, 720p, and several other resolutions, its “native” resolution is 4K. Another example: A theatrical movie’s native frame rate is 24Hz. A/V. Audio/Video. Relates to sound/picture. Codec. Sometimes referred to as A/V format. Software or circuitry that encodes/decodes and serves as a delivery system for digital audio or video. Common video codecs include H.264, H.265, and VP9. The most common audio codec is PCM, often compressed to MP3 or AAC. High Dynamic Range (HDR). Expands the range of both color and contrast in a video picture, providing more “pop,” brighter colors, more “depth,” and a greater range of shades between black and white. Experts agree that HDR vs. standard dynamic range (SDR) represents a much bigger jump in picture quality than 4K vs. 1080p. HDR10. The most common form of High Dynamic Range (HDR), found in all devices that tout HDR. Also called “static HDR,” as one color/contrast dynamic range is applied to the entire video file (Blu-ray, streamed movie, etc.). HDR10+. A newer form of HDR also known as “dynamic HDR,” as the color/contrast dynamic range is applied scene-by-scene (dynamically), enabling brightness levels to shift more accurately according to each scene’s lighting. Codeveloped by Samsung and Amazon, even though HDR10+ isn’t supported on any Amazon devices. Dolby Vision. Considered the 800-pound gorilla of all HDR formats. Like HDR10+, Dolby Vision is dynamic HDR, but on steroids. Dolby Vision is Dolby’s proprietary form of HDR, a fully turnkey system from production to distribution to playback. 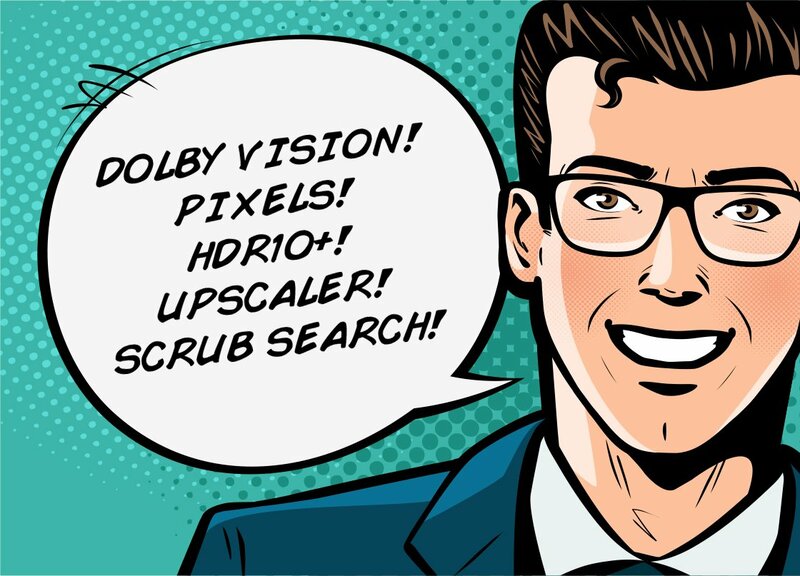 As of March 2018, the only streamers featuring Dolby Vision are the Apple TV 4K and the Google Chromecast Ultra. Dolby Digital. The basic default digital surround sound format. Featured in virtually all audio/video receivers, videogame consoles, streaming boxes, cable/satellite boxes, and Smart TVs. Dolby Digital Plus. A surround sound format improved over Dolby Digital with more potential channels, less compression, and higher data rates for a superior audio experience. Featured in all top streaming boxes except Apple TV 4K. Object-Based Surround Sound. Surround sound that adds a third dimension to the front-to-back orientation of typical surround sound. That dimension is height. By adding height circuitry along with additional, elevated “height” speakers, onscreen objects can be placed anywhere in the room in three dimensions for perfectly directed sounds on every axis and plane. Dolby Atmos. Dolby’s flagship surround sound format. Object-based surround sound that sonically locates onscreen objects in all three dimensions. As of March 2018, the only streaming device featuring Dolby Atmos capability is Fire TV. DTS-X. DTS is a competing surround sound format to Dolby. DTS-X is their flagship surround sound format. Object-based surround sound that sonically locates onscreen objects in all three dimensions. Currently featured only in separate audio components, not streamers. 5.1, 7.1, etc. Refers to the number of surround sound channels (or speakers) in a home theater system, or played by a video source such as a Blu-ray disc, videogame, or streaming movie/show. The “5,” “7,” etc. refers to the number of primary speakers or audio channels, and the “.1” refers to the number of subwoofers or bass channels. HDMI. High-Definition Multimedia Interface. Refers to the cable, connector, and/or port for connecting two high definition or Ultra HD devices. Bandwidth. In streaming, it’s the space open to a digital audio/video signal. 100 megabits per second (100Mbps) is currently more than enough bandwidth for any type of streaming; 12Mbps is likely enough for HD streaming but not enough for 4K HDR streaming. Picture Artifact. Anything (noise, distortion, interference, etc.) that doesn’t belong in the picture. Compression. The process of digitally “squeezing” (reducing bits from) an audio or video signal to save bandwidth. All streaming services (Netflix, etc.) use compression, as it’s particularly useful for slower Internet connections. However, excessive compression is the cause of most picture artifacts. Bluetooth Remote. A wireless remote control that operates via radio frequency (RF), rather than line-of-sight as do infrared (IR) remotes. This means that you don’t need to aim the remote at the component being controlled. However, it also makes it difficult (sometimes impossible) to program the remote into a superior universal remote control. Among streamers, the Apple TV 4K and the Roku devices feature Bluetooth remotes that can also be programmed for universal remote IR control. Transport Controls. Whether featured on a device or its remote, these are the controls that enable transport functions such as Play, Pause, Stop, Fast-Forward, and Rewind. Scrub Search. A form of transport control that allows the user to visually “scrub” (hyperfast fast-forward and rewind) through a movie or show, using finger gestures. Currently featured only with Apple TV.